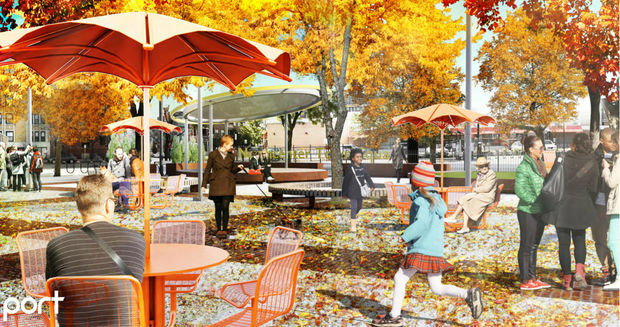 North Center Town Square Final Concept Unveiled; How Much Will Get Built? 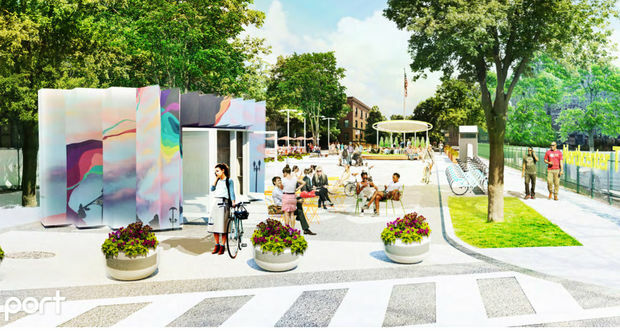 NORTH CENTER — The final concept design for North Center Town Square shows the existing plaza transformed into a bustling community hub, complete with a turf lawn, performance stage and pop-up retail. But how much of this vision will actually get built? 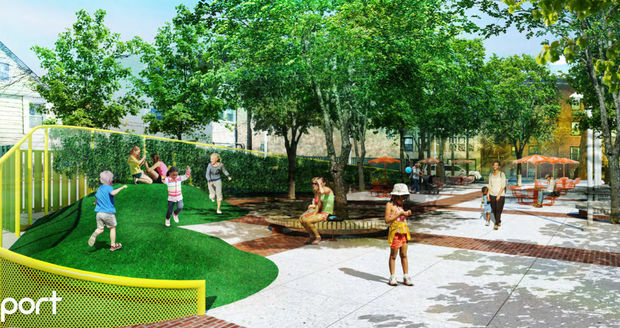 That was the question on neighbors' minds as the monthslong design process, which kicked off in March, came to a close at a recent public forum. 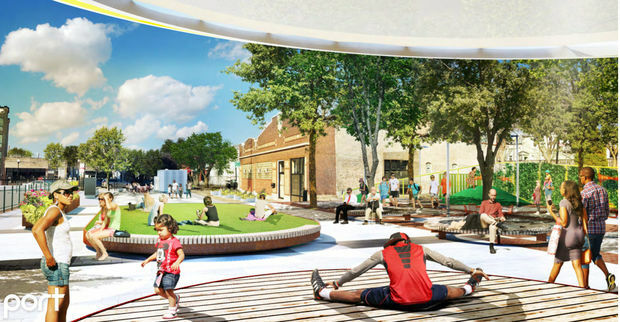 Andrew Moddrell of Port Urbanism shared his firm's proposal for the square at 4100 N. Damen Ave. It incorporated feedback from hundreds of residents and will continue to be tweaked, he said. "This isn't what will be constructed tomorrow," Moddrell said. "It will be refined." • A "lawn" of artificial turf on a raised pedestal system. "Currently there's nowhere soft to put down a blanket and read a book," Moddrell said. The turf is a way to soften the space without actual grass. • A circular performance stage, covered with a canopy, that can double as seating when no events are scheduled. • An ivy-covered fence that would buffer the square's north side from an adjacent alley. • Seating that includes some sort of shade umbrella to compensate for the pending removal of nearly all of the plaza's trees, which were found to be unhealthy. Only three of the current trees will remain. The next step is to translate the concept into construction and engineering drawings that specify infrastructure requirements and materials. The budget for the project is $600,000, funded with aldermanic "menu" dollars. 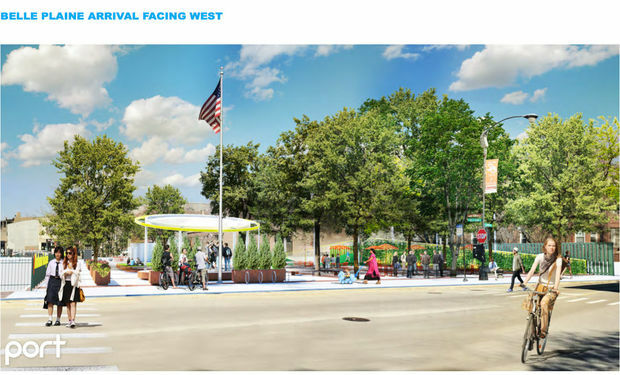 The pedestal system — a way to bring the square's street and cul-de-sac level with the existing plaza — is the biggest ticket item, Moddrell said. "Once we know what we're procuring, then we can better tell what we can pay for," said Jim Poole, chief of staff for 47th Ward Ald. Ameya Pawar. The goal will be to "take as big a bite of the apple as we can," Poole said. 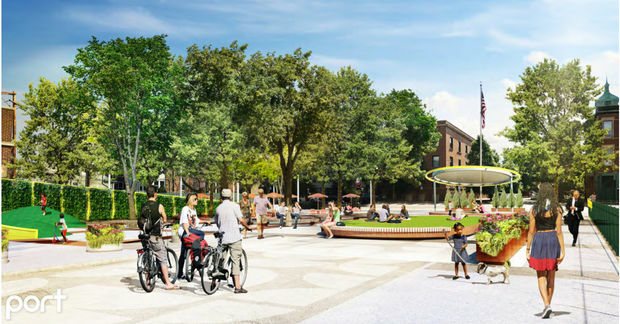 A potential first phase could consist of: the raised lawn, play mounds, decorative fence, performance stage (minus the canopy), pedestal plaza, new trees and some furnishings and planters. 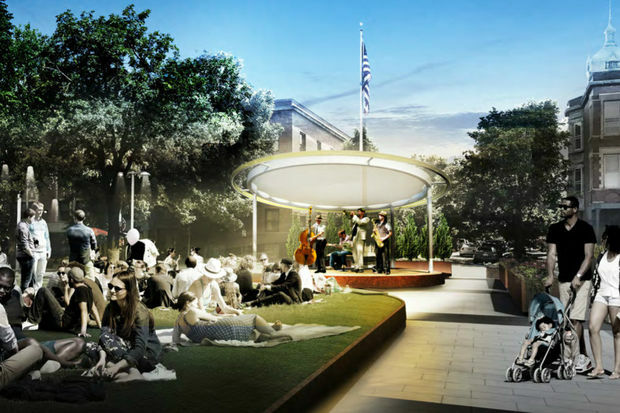 A second phase, which could require more fundraising, could include enhanced accent lighting, the canopy for the stage, signs and circular benches surrounding the trees. Construction could start in spring 2018. Check out the renderings, all courtesy of Port Urbanism.